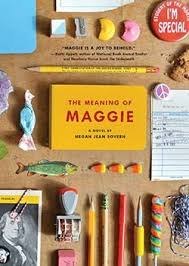 Maggie is beginning a new school year and has decided to write a memoir of her life. She knows that when she becomes president someday everyone will want to know about her childhood. As always, she is at the top of her classes and is one of the students of the month every month. She's also happy to be beginning her financial future with one share of Coca-Cola stock which she receives on her birthday. Life at home is a little different than usual, however. Her mother has now gone back to work to support the family while her father stays home because his legs go to sleep much more often. As her father has more health issues Maggie decides that she will do her science fair project this year on Multiple Sclerosis to learn more about what's happening with him. Maggie is a likeable character if a little nerdy. Her parents are also fun. I thought they were really retro until I finally realized that the book is actually set in the 1970's. The name of Dad's disease doesn't come up until at least halfway into the book which I found a little frustrating but I think the book is presented in the way a child would actually be experiencing living with this.